Prefolds represent just the absorbent portion of most other diapering options. The center portion is usually made of between 4-8 layers of material that are sandwiched together. There is no elastic around the legs to prevent gaps and no waterproof layer, so prefolds are only waterproof if covered with something else that is. They do not have a feel-dry face. Prefolds can be secured with pins or snappis or laid into a cover. If wool is used for the cover then laundering is generally done separately for those. Prefolds must usually be layered together for night use. Because of the extra steps involved in using prefolds, diaper changes take longer using prefolds than other forms of cloth diapers. Squirmy toddlers don't necessarily like staying put for this amount of time and most covers do not work as pull-up diapers either. 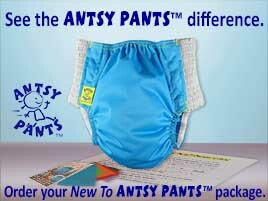 So how do Antsy Pants™ compare to prefolds? Antsy Pants™ are very convenient to use with their incorporated waterproof layer and pull-up functionality perfect for toddlers on the go. Antsy Pants™ do not need any additional covers, pins or snappis. Antsy Pants™ leg openings are shaped to come in close contact with your child's inner thighs to provide a very good, leak-resistant fit.